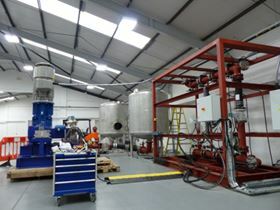 The new reciprocating plunger pump test rig at Ruhrpumpen in Lancing, UK. The new facility allows Ruhrpumpen to bring the assembly and testing of its reciprocating plunger pumps together with its design team. Ruhrpumpen already has its own foundry and global manufacturing facilities, including a plant in Witten, Germany, that will supply the UK facility, in addition to an established supply chain in Europe that will continue to provide ancillary equipment such as seal systems and motors. The new building in Lancing provides offices and manufacturing space for the expanding team of engineers who are designing Ruhrpumpen’s range of RDP API 674 3rd edition, ISO 13710 triplex and quintuplex pumps. The assembly facility is laid out on a work-cell principle. A new test rig can handle flows of up to 400m3/hr for testing two packaged systems at any one time. Pumps can be switched in and out quickly and efficiently to save idle test time and increase throughput. The test rig has partial automation with flow and pressure ranges controlled by variable speed drives. The rig also has full capability to carry out testing in accordance with API and Hydraulic Institute standards together with remote testing via video links. Ruhrpumpen has inaugurated a new purpose-built manufacturing plant in Chennai, India.